UnitedHost Revolution Review 2019: Is UnitedHost Revolution a Good Hosting? An Italian website hosting provider that has been in business since 1996, United Host offers a range of hosting services for beginners. 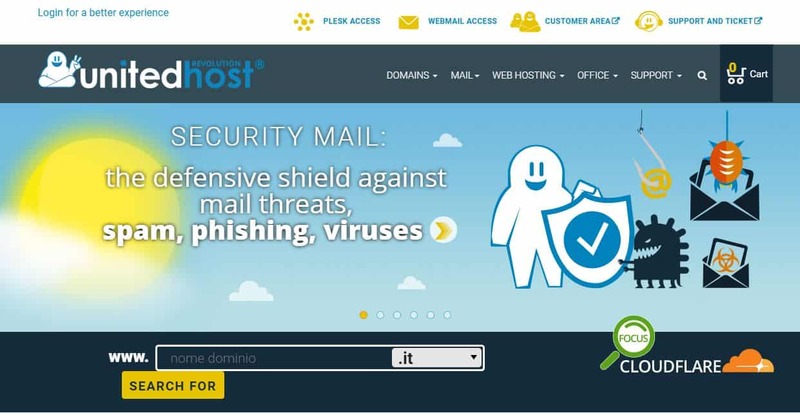 Italian website hosting company United Host was founded in 2013. It is part of a larger group of companies that have been in the information technology field since 1996. They own their own data center in Brescia, Italy, and have an average uptime of 100% backed up by a 99.99% service level agreement. Their Italian-only website suggests a mainly Italian customer base. United Host offers a selection of beginner-friendly features. Firstly, some of their packages come with WordPress pre-installed. Secondly, they come as standard with some neat security features such as CDN with Cloudflare for maximum performance and security (WAF basic and shared SSL). Thirdly, new e-commerce store owners will like the plan that comes pre-installed with PrestaShop. They own their own data center, which usually means a quicker response time to issues and faster website load speeds. Their devices and connections are fully redundant. They connect to three data centers in the north of Italy, giving the benefit of geographic backup in the event of an outage. This gives them the confidence to back up their 100% average uptime with a 99.99% service level agreement. While there is undoubtedly an option for everyone, I have to say that United Host’s packages are a little confusing. They have eight shared hosting packages: Naked Web, Web Naked Plus, Blog and Post, E-commerce, Web and Post, CloudFlare Business, CloudFlare Pro, and Secure Web. You can choose a number of customizations at the checkout including Windows or Linux operating system, dedicated IP, unlimited web space, extra MySQL databases. It’s important to note that all these customizations (plus domain registration) come at extra cost. However, SSL certificates are included. The basic package is available in one, two and three-year terms, whereas the most expensive plans are also available in two, three, and six-month terms. You get a small discount for purchasing a longer term, but beware that there is no monthly plan, no free trial, and no money-back guarantee, so you need to be sure about signing up. There are several customer service levels. Basic support is included free with all hosting plans; it allows customers to email or to submit support tickets 24/7 for assistance between 9 am to 5 pm. Paid customers get 24/7 telephone support. This company also has a very comprehensive FAQs section. The support is great but I can’t help feeling it is overly complex. Since their inception in 1996, this company has grown from strength to strength, and in 2013 they were further strengthened by teaming up with similar brands and rebranding as United Host. They now have tens of thousands of customers served by more than 500 physical and virtual servers. Wondering how UnitedHost Revolution stacks up against other Web Hosting companies? Enter any other Web Hosting company and we will give you a side-by-side comparison.